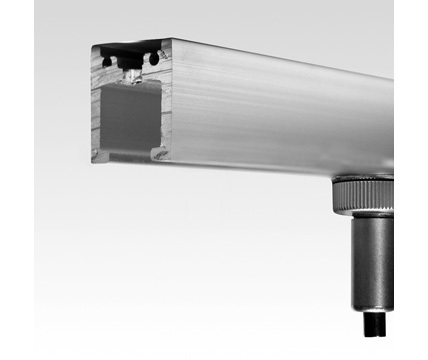 The CRB/CRC rails offer the same flexibility of the wall-mounted rails, but in a ceiling mounted installation. These 6′ rails are ideal for hanging art, signs, or even shelves. Rail clips can be moved along the rail in any increments, allowing displays to be quickly positioned exactly as desired. By mounting an additional rail in the floor, the user can tension cables to the floor, reducing normal cable sway. The rail fittings accept either 3/64″ or 1/16″ diameter cable, so the displays are functional using the full range of Arakawa products in these cable sizes.